This Read and Respond Prompt will help your students develop reading comprehension, literary response & analysis and writing skills. Each day, your students will answer one Read and Respond question related to their choice reading book (or an assigned book if you prefer). I highly recommend implementing this prompt along with choice reading as it cultivates a love for reading in and beyond the classroom. 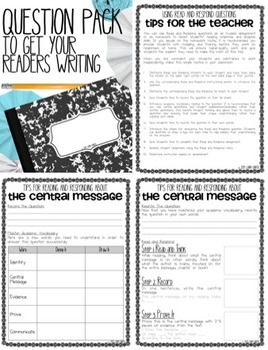 For a more thorough explanation of how you can incorporate Read and Respond prompts into your classroom curriculum, feel free to read my blog post, Read and Respond Journals.